Driving an amp is what makes rock music rock, and it has become such a mainstay in today’s culture that even music traditionally less aggressive (e.g., country) has stepped up to the plate with greater push and shove in guitar tones. Driving an amp refers to an increase in distortion and/or overdrive (although they both have slightly different meanings and qualities, they often go hand-in-hand and co-exist in some quantity or capacity). To achieve that driven sound, there exists some modification to the normal wave form or signal of an amplifier, whether achieved directly through the amp by approaching its full capabilities, or done through second party equipment, e.g., a pedal. Originally, before the advent of pedals, we had to overdrive amps that contained vacuum tubes, which produced ‘valve’ distortion (solid-state amps create that drive distortion by way of specialized transistors and/or operational [op] amps). But to achieve that effect even at low levels, and to save our ears from the decibels of damage, electronic wizards began developing little ‘magic boxes’ to accomplish a very similar effect. A negative to these boxes is that they often do not sound warm and natural like the drive of an amp; yet on the other hand stomp boxes could create an exaggerated overdrive and distortion that exceeds what an amp could achieve (although modern amps have specialized circuits to produce distorted and overdriven tones that are not possible with their vintage cousins). While several companies are attempting to develop advanced effects, the music gear industry has taken an interesting turn in the past decade. Like the desire to own a vintage or custom guitar, progressively greater musicians are searching for boutique pedal companies that are able to capture sounds of the past. Even modern metal bands are avoiding some of the more modern distortion and drive pedals because they sound thinner and more processed, which then alter the original tone and dynamics of the guitar and amp. And as appealing as some sounds may be, it is those older ‘thick’ tones that captivated us and which now has allowed the smaller pedal companies to influence the industry and benefit the studio and gigging musician who want the tones of yesteryear. SolidGoldFX is a young veteran company (headed by Greg Djerrahian), and what it has produced is a must have for any electric guitarist, whether wanting an extremely modest warming of a tone to a downright aggressive distortion. Introducing the SuperDrive: a true bypass analog hand-made pedal that is not your typical ‘drive’ pedal, and in more ways than one. It is rather special in its overall quality in that it sounds as though it’s an actual extension of your amplifier – yes, it sounds that natural! 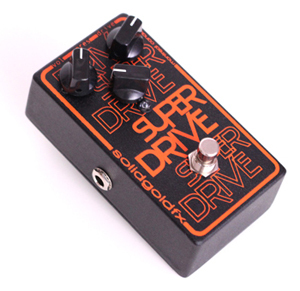 Highly responsive to a player’s dynamics (giving more drive/distortion relative to how hard you play), you could say that the SuperDrive is very ‘amp like’ in how it behaves and sounds, which is not the case for most stomp boxes that color an amp’s characteristics. Rather, the SuperDrive is very transparent and has a way of enhancing an amp and guitar pickups rather than covering them up (what you put in is what you get out, but superior and improved several-fold), and so if you like your amp and pickups’ sound and gain characteristics (but you want more), you will adore this pedal. The SuperDrive literally super-charges your gear! Currently the retro trend seems to be the emulation of 1960s sounds and tones, but the SuperDrive focuses on guitar qualities of the 70s, and it does so extremely well. Unusually quiet considering what it does (the quietist I’ve heard), the SuperDrive offers a classic and high quality sound that is full… so full that it makes those weak and sparse single coil bridge pickups step up with some balls and create a wall of sound – if you want that high end lead, but found you needed to add some neck or middle pickup for a boost, you no longer need to do so. Solid construction, the SuperDrive is easy to use, but it offers a lot of tweaking to achieve varied results. I’ll address some basics about the pedal’s tone and then get into the specifics. As with most drive pedals, there are volume and drive knobs. Pretty obvious, but the volume has a very nice effect on the degree of drive, et. al., even when not altering the drive setting. In other words, the volume knob pushes all the factors to the limit, making each characteristic (the pedal’s drive, distortion, presence and bass response) exaggerated or enriched. The drive increases the degree of crunch and grit, but it also produces an increasingly brighter sound the more you turn it up. This means that as the signal is boosted the overall tone does not muddy up – nor does it produce excess harmonics and noise as one might suspect. The SuperDrive has two other valuable controls: presence and a bass drive switch. The presence knob works as a low pass filter to control high-end content while preserving the lows. When coordinated with the drive knob, you can achieve some very different distortion tones. The presence has a tremendous effect on how ‘heavy’ a tone you want, and it’s on this pedal for good reason: the SuperDrive’s effect is very thick and the presence helps to add some ‘cut’ to the mix. The presence is not like some I’ve heard on amps and multi-effects pedals, which tend to thin out the sound and even make it slightly shrill. Rather, the tone remains full bodied and crisp. Without touching the drive level, whether low or high, the presence alone creates a nice cutting effect, thus allowing for pinch harmonics to ring clearly. The two-way tone switch allows you to go from tight to beefy in the bass end, and this aspect becomes more apparent and audible as you increase the drive – but even when set to a more beefy bass, with a lot of bottom end, the notes remain clear. This is the feature that will add far more fullness to those single-coil pickups, and particularly at the bridge. You still can have the clarity of a bridge pickup, but now more full-bodied. Again, you get those classic 70s rock amp tones with plenty of warmth, but with an obvious clarity and no muddiness (even when pushing the pedal’s bass response). However, to reiterate I will state the obvious to those who have heard or used this pedal - the sound possibilities are soooo varied. With the volume and drive cranked you experienced thick stacked saturation with a good dose of crunch and a hint of fuzz, and when turned low you get anything from ‘tube warm’ singing tones to a fairly clean boost with subtle grit and no harmonic artifacts. Yes, this is more than an ‘overdrive’ pedal as it merges so many elements into the tones it produces, and likely because it does enhance an amp and guitar pickups’ output. Focusing on the specifics, I used an Egnater Rebel-30 amp on a clean channel, an Ibanez JS2400 guitar and an Eastwood Airline ’59. The former guitar is more a virtuoso/rock instrumental axe, the same used by Joe Satriani, whereas the latter guitar’s tone and output resembles more a vintage guitar that originally was not designed for hard rock and ‘beyond.’ Nonetheless, although I got more ‘punch’ from my Ibanez, the Eastwood certainly would not give rockers any complaints as it sounded far more full-bodied as a result of the SuperDrive. Tonal characteristics were different with each guitar, and how it responded with the amp, but when tweaking the SuperDrive you achieve similar outcomes. As I turned the drive down, to about 9 o’clock, while the guitar and pedals’ volume remained the same, the result was a very rich sounding ‘clean’ (not super clean, but only modest grit)… you could play cords, but the result was a thicker and richer tone while maintaining the clarity. Then I put the drive up full and the pedal’s volume half way. As I turned down the pedal’s volume knob I did not experience a sudden volume drop. In fact, the difference between setting it at 9 o’clock and 5 o’clock (full tilt) was only about 10-20% difference, like a boost of sorts and while enhancing or reducing the edginess of the drive accordingly. With the drive and presence turned down to about 9 o’clock, you hear a modest degree of distortion with a hint of sizzle in the mix, ideal for some heavy blues playing and softer rock, and almost reminiscent of Smoke on the Water when power-chording on my JS2400. The pedal is very responsive to the guitar’s volume knob. I set the pedal’s volume and drive half-way, but reduced my guitars’ volume by nearly ¾ - the volume of the music remained nearly the same (perhaps a 10% drop), and that is partly due to good electronics in the guitars – but the interesting thing is that the tone changed significantly. For example, when I turned the drive up full and presence at about 11 o’clock, you would think that the drive and brightness response would be very high, but with the guitar volume set at only half-way or a bit less I could get an extremely smooth sounding distortion through my neck pickup on my Ibanez, similar to that of David Gilmour. Thus, even with the pedal pushing hard, you can achieve unusually smooth drive just by lowering the guitar’s volume – shifting from dirty and raunchy to warm and mellow in no time flat. Very nice! After several hours playing with the SuperDrive, I preferred it on the amp’s clean channel, since the pedal alone has so much potential aggression. However, for those grittier guitar parts, you do achieve a more ‘raw’ biting tone as you tweak an amp’s gain channel. And what I should point out is the amp I use, the Engater Rebel-30, offers EL84 (British) and 6v6 (American) mixes – all of one and none of the other, or a mix of both tube types in any ratio desired. Not all amps offer this customization, and I’m certain some readers may be interested in how the tone alters between the two tube types and how the pedal handles these tube variations. Not much can be said, but WOW! As stated previously, the SuperDrive is like an extension of your amp, sounding not only very natural and ‘authentic,’ but able to enhance what exists already in the equipment. EL84 tubes tend to have a fatter sound with more mids and the SuperDrive boosts those characteristics (although it does not add to increasing the mids). The 6V6 tubes have a sharper and clearer sizzle and, again, the SuperDrive boosts those characteristics while sustaining a smooth and creamy tone. It was as though I had a ‘super’ gain/distortion built directly into the amp and not a pedal sitting on the floor (the Egnater’s gain is sufficient for softer rock and blues, but lacks that huge distortion sound, whereas the SuperDrive acted as my Frankenstein gain channel). Something that impressed me further was how the SuperDrive responded with my Wah pedal (Vox’s Big Bad Wah). I have a few other specialty boutique pedals (fuzz, distortions and overdrives), and I found my Wah colored the sound of those pedals enough that you lose the original and intended tones of those pedals. I like keeping my Wah on with ‘toe down’ as it gives me a nice bite and more mids, but to get those nice flavors intended by the other boutique pedal manufacturers, I need to keep the Wah off unless I intend to use it specifically. This is not the case with the SuperDrive – I can use my Wah to accentuate the mids and without it coloring or affecting the original tone signal of the SuperDrive to any significant degree. The value of a pedal will be based on how often it is used, and how long it will stay on your pedal board, and I suspect anyone who uses the SolidGoldFX SuperDrive will treat this pedal like gold and have it stomping around for a long time. With something of this caliber in the industry, it is surprising that so many musicians still consider the big-name companies that produce far lesser products that sound lackluster compared to the SuperDrive. It’s one of the most perfect sounding distortions I have heard. Pluses: Works well at both lower gain and higher gain settings, with an even wider array of tonal possibilities as you tweak the pedal’s presence and bass responses, as well as your guitar’s volume. You can achieve classic tones of the 70s, but it still sounds very modern. The quality is amp-like and it pushes your equipment to new limits and dimensions without altering your gear’s natural characteristics. The SuperDrive works very well with both single-coil and humberbucker pickups, and ‘sits up and takes charge’ when you couple it with the SolidGoldFX ‘Nitro’ so that you can experience further increases in creamy saturation and thickness while the tone ‘sparkles.’ Minuses: If you want something that makes your amp sound a lot different, then you’re likely better off looking toward a fuzzbox or some other type of distortion/sound effect module. The SuperDrive does not emphasize or increase the mids, and if that is what you’re after you will need to tweak your amp or a pedal EQ to achieve that end.